The RFMS is a non-auditioning choir open to anyone aged over 16. Members do not need to be able to read music however an ability to sing reasonably well in tune is expected. 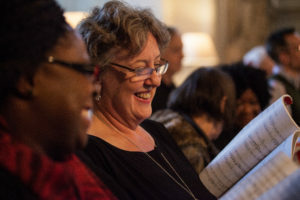 The choir is based at the Royal Free Hospital and welcomes hospital staff, current and former patients as well as members of the local community. We are an inclusive choir and aim to ensure that our activities are accessible to all. 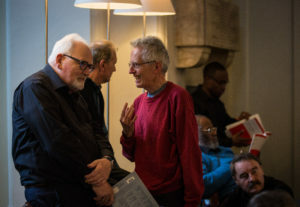 Rehearsals are usually held on a Thursday from 7 – 8.30 p.m. in the Peter Samuel Hall at the Royal Free Hospital. Google Map. You are welcome to come and try us out for a week or two before you decide whether to join the choir. After rehearsals many of the choir members make their way to a local pub for a drink and/or a bite to eat. Please come and join us; it is so much nicer if we get to know the choir members. There are also one or two organised social events during the year. We do expect members to do some ‘homework’ between rehearsals so that we make the most of our time together. The midi files in the members’ section of this website are designed to support that and are a fantastic resource for members.